As physical scientists help us learn more about climate changes that may occur with global warming, social scientists focus on how we can adapt to those changes. However, because the interacting effects of both climate change and social forces are highly complex, uncertain, and localized, physical and social scientists may be more effective in addressing the challenges that climate change poses by joining forces and working together in interdisciplinary teams. In 2011, Mike Crimmins, a climatologist, and I, an anthropologist, both with the Climate Assessment for the Southwest (CLIMAS) at the University of Arizona--and with funding from NOAA's Climate Program Office in support of the U.S. Global Change Research Program's National Climate Assessment--conducted a study designed to learn how federal agencies could provide climate-related information and programs to better meet the needs of rural Arizonans. But in order to understand what kind of information rural Arizonans would find relevant and useful, we first needed to understand the context in which it would be used, including the ways that rural Arizonans typically understand, plan for, and respond to weather and climate in their daily lives. Thus we held a series of group discussions in eight of Arizona’s fifteen counties, organized with the help of University of Arizona Cooperative Extension. Participants included rural residents from a variety of groups for whom weather and climate are a significant factor in their work or lives, and who had lived in the county varying lengths of time. We started the discussions by asking each participant to tell a story that would illustrate how weather or climate affected his or her life, and the discussions just took off from there. We learned that rural Arizonans are highly attuned to weather and climate in their daily lives and are constantly adjusting to the dry and highly variable climate of Arizona. The weather/climate-related topic that emerged as by far most important to them is water. 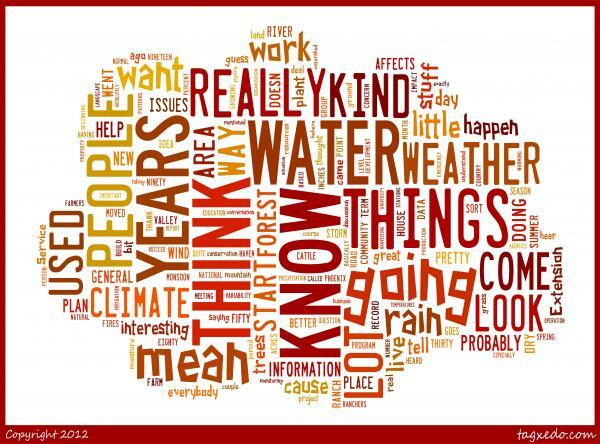 In the context of an extended drought, drought and wildfire were the topics that generated the most concern. We did not ask specifically about climate change, but in every discussion, participants spoke of changes they are experiencing in the weather and climate patterns they are accustomed to: the current drought is lasting longer; monsoon rainfall is more “spotty” but often more intense and destructive; winters are not as cold and snowy; temperatures, variability, and extremes are increasing. While they were hesitant to attribute these changes to “climate change,” a politically charged topic, they clearly were concerned about the effects of these changes on their lives, communities, and local environment and motivated by attachment to the place they live to take steps to address them. The discussions revealed that adaptation is a process in which rural Arizonans are constantly engaged, although not solely in response to climate. In the next blog I'll describe the model we developed based on these discussions. It enriches our understanding of climate change adaptation at the local level, and points to directions for the development of new approaches to understanding and supporting climate change adaptation.